We offer riding lessons for beginner to advanced riders in hunter, jumper, and equitation. We have three professional trainers on staff who teach seven days a week and our large indoor arena makes for pleasant riding year round. We also have two outdoor arenas with all weather footing and we pride ourselves in having a wonderful selection of safe and well trained horses and ponies for your riding instruction. ​Our dedicated staff provides lessons to all levels of riders. We are here to help you meet your goals. Many of our students just love horses and want to learn how to ride "just for fun". Other riders at our farm have made it their goal to win ribbons at the top horse shows locally and regionally on the east coast. Please give us a call to meet the staff and tour our wonderful facilities. Having an understanding and respect for horses makes a big difference when it comes to training. While there is a basic framework for breaking a horse or training a pony, we take into account that horses have different personalities. Beth and her team ensure a proper foundation and the best results. 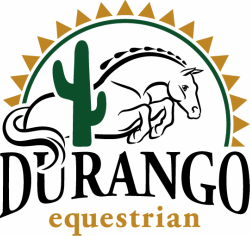 Durango Farm frequently has quality horses and ponies for sale of all ages and abilities. We also offer leasing for competition or pleasure riding starting at $375 per month. Please contact Beth to help you find your next equestrian partner! We do require a 24 hour cancellation notification or you will be billed for your lesson. Please be considerate of others and especially the horses and ponies waiting for you. We understand things come up and are happy to hold your current lesson time for 1 month. After 30 days we can not guarantee you the same day and time and you will need to call to reschedule. Please be on time and ready to ride with the proper equipment. We always have extra helmets for you to borrow. Parents are welcome to drop children for their scheduled lesson time. Please check in before you leave or call if you are running late to pick up your child. Friends are always allowed to visit and watch the lesson. Anyone under 18 who is not taking a lesson is required to be supervised by a parent or guardian over the age of 18.